Gbanga Famiglia creator Gbanga has announced its newest title, Famiglia Rise and Fall. The sequel takes players to an open world, based on real world data, and in the process looks to turn the MMO into a title players will want to play anywhere, and at any time. To help support the title, Gbanga has launched an Indiegogo campaign for the app, which it hopes to release on iOS and Android. Famiglia Rise and Fall will throw players into the world of the mafia, as an up-and-coming mafioso out to gain control of his or her own neighborhood. Players will gain money by taking over local bars, restaurants and banks, with these funds then being used to travel around the world or purchase additional establishments. As players rise through the underground ranks, the police will catch wind of their actions, sometimes triggering car chases with police cars or helicopters. During these events, players will need to escape by avoiding open public spaces. Real-world gamers and non-player characters (NPCs) can offer support to others in exchange for favors, like driving getaway vehicles during robberies or patrolling an ally’s territory while they’re away from the game. 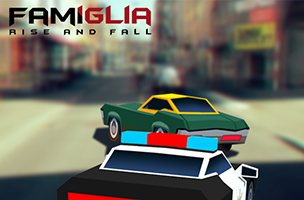 Famiglia Rise and Fall will allow players to complete mini-games and quests as they take over territory. In some cases, they may need to walk around the real world, in real time, to trigger GPS triggers for their in-game avatar to also move around. The game has been designed to be as realistic as possible, to help gamers know their way around and more easily complete tasks. Long-distance car races are also in the works, which may see players racing from New York to San Francisco, or Paris to Dakar, as examples. These races take place in real time, so they’ll take hours to complete, but players can take breaks. So far, Gbanga’s Indiegogo campaign for Famiglia Rise and Fall has reached $8,000 of the company’s $60,000 goal, with 11 days left. For more information, check out the video above, which shows off the San Francisco area, as it will look within the game.